Leasing office for The Grove apartments moves out of 328 South Tate Street on Tuesday. 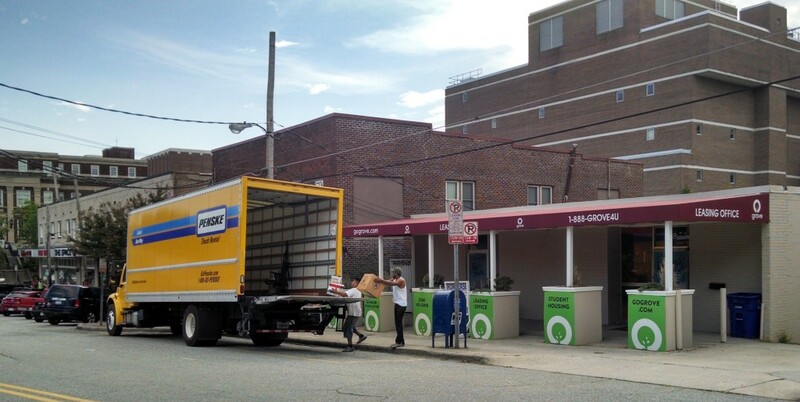 The leasing office for The Grove apartment complex has moved out of its Tate Street office. The Grove was the first office tenant for the space at 328 Tate Street after the longtime pool hall-bar-private-club building was converted to offices. That was a positive development for the neighborhood after a string of problematic businesses there (remember the poker bust last year? and the fatal shooting in 2011? yeah, that place). Now the space is available. The Grove’s leasing office presumably has moved into the complex, not far away off Freeman Mill Road, I think. For what it’s worth, the complex’s website contains a list of amenities that includes the usual (pool, fitness center, indoor tanning) and something labeled a “Harvard-style library.” I didn’t go to Harvard, so I don’t know what the oldest library in the United States, the largest private library in the world, and its 18 million volumes have in common with the library of a new student apartment complex. But whatever they’re getting at, that’s some first-class marketing talk. This entry was posted in Businesses, Tate Street. Bookmark the permalink.